Last night the House voted 257-167 to approve the fiscal cliff bill that was passed early Tuesday in the Senate. The bill allows for tax increases on individuals and households making over $400,000 and $450,000 respectively. Incomes above that level will now be taxed 39.6 percent. Capital gains and dividend tax rates would rise to 20 percent for those above that income threshold. And the bill delays spending cuts by two months. "We’ve no great disagreement with the legislation as it stands except for the fact that this is an overtly anti- marriage decision and therefore manifestly discriminatory on its face and there is of course a marked lack of spending cuts and as we all know the problem with the US fiscal deficit is not one of revenue but is one of egregious lack of discipline on spending. Regarding the former concern, unmarried up-income couples will have their taxes held at current levels while upper-income married couples with the same incomes will see their taxes raised materially. Even the French Supreme Court has found that wrong. 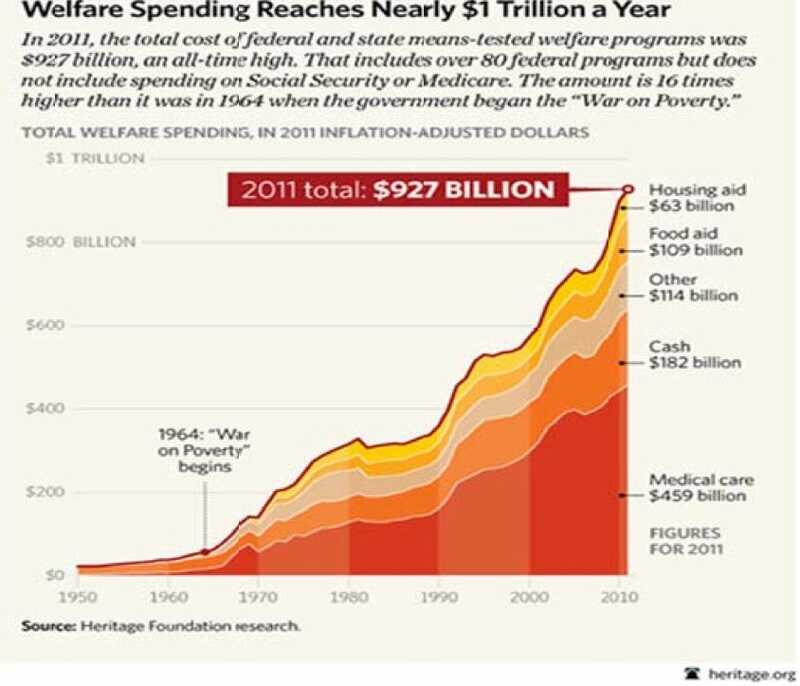 Regarding the former concern, we point to the chart [see below] regarding welfare spending which has now reached $1 trillion per year and we are not including here spending on Social Security and Medicare. These are simply unemployment benefits, spending on food stamps and other true “welfare” related programs. And to remember, the figures included here are for 2011. 2012 shall obviously have been far higher and 2013 shall be higher still. We shall not mince words here then: What the House and the Senate have agreed upon... and what the President has said he shall sign... is horrible legislation and were we a Congressman or Senator we’d have voted against it so long as we had “cover” to do so; but the government needed to be funded; taxes need to be raised; armies, navies and air forces need to be secured et al and in the end there was no choice but to vote for the legislation’s passage. The Left has won. The President has succeeded in moving the country along the path toward socialism. Those who have succeeded in life will pay for that success with higher taxes; those who’ve failed will be paid by those who’ve succeeded. Paul will be paid by Peter and Paul’s support has been won ... perhaps eternally. Will spending cuts be debated later? Certainly they will be, but just as certainly they will be defeated. Revenues are always raised at the margins, and fail inevitably to raise new revenues, while spending is always supported in any number of way, demanded by the “poor” and by “minorities” and by the “downtrodden” and by whatever euphemism the Left can conjure up. But the country pushes on despite all of that. We are not sure whether to cry or laugh; to applaud hang our head in despair. Perhaps it is best simply to say that we’ve lived to fight another day."